Dynamic Data Authentication (DDA) is a more securer way of authentication because it authenticates the card itself. After the authentication we can trust on the uniqueness of the card. SDA guarantees that data on cards is valid because we trust a high level certification authority which signs the data. But an attacker can record a card session and build for example a new virtuel card. In contrast to SDA the card creates during the DDA process an own signature with their private key (SIC). This signature is different in every card session because it contains a random number generated by the terminal. The corresponding public key is stored in an ICC Public Key Certificate signed by the Certification Authority. With the public key we can proof the signature on genuineness. 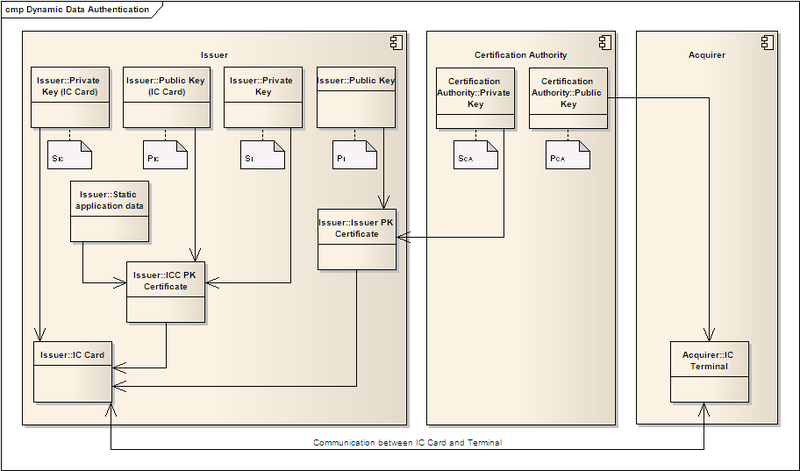 The dynamic authentication process is related to SDA. With PCA the terminal proofs the signature of the Issuer PK Certificate and extract the P1 key. The terminal proofs with P1 the signature of the ICC PK Certificate to get the PIC key. Now it is time to send an Internal Authenticate command to the card that contains a random number and initiates the card to compute the signature (Signed Dynamic Application Data/SDAD). With the PIC key the terminal checks the SDAD for guineness. The retrieval of ICC Public Key starts after the Retrieval of Certification Authority Public Key and Retrieval of Issuer Public Key described in the chapter SDA. First we have to decrypt the ICC Public Key Certificate. 0020  50 B8 7A 88 88 6F 74 11 D1 44 47 C8 88 46 93 F7  P.z..ot..DG..F..
0030  0B C5 B3 A2 63 E4 0D 14 7A A3 10 47 33 73 73 B9  ....c...z..G3ss. 0060  6B FD 43 AB 02 76 E3 11 C7 3E 17 1E A7 C8 04 21  k.C..v...>.....! 0070  85 55 D8 0C 4F E8 D1 DC F0 7D 1C D5 61 46 57 BC  .U..O....}..aFW. With step 1 to 4 we check whether the decryption was succesful. Step 5 implements the concatenation which is necessary to apply the hash algorithm in the next step. //         in the Certification Expiration Date is equal to or later than today's date. // Not proved, so you can test your expired cards. If step 5 to 10 were successful we can start concatenating the ICC Public Key (PIC). The Internal Authenticate command initiates the card to sign with their Privat Key (SIC) Dynamic Application Data and a random number generated by the terminal. The card will return the Signed Dynamic Application Data. If the following 7 steps were successful, DDA was successful.